Joe Southard Joins Bob’s BMW as the New GM! Bob and Suzanne are very happy to announce the hiring of Joe Southard as the new General Manager of Bob’s BMW Motorcycles. For the past 35 years, the Bob’s BMW’s mission has been to provide the riding community with a complete ownership experience that consistently exceeds expectations. With Joe on board we plan to polish the Ultimate Motorcycling Experience to an even brighter sheen and make our red carpet even plusher for our customers, all while striving to make Bob’s BMW an even better place to work. Bob & Suzanne knew they had found the perfect fit for this position when they met Joe. Solid Background – with 15 years of leadership in retail, sales, merchandising, and operations Joe has the skills to raise the bar at Bob’s. He has proven results in implementing strategy and operational best practices, building effective teams, and creating and maintaining a positive and energetic working environment. Candor and Caring – Joe sincerely cares about helping the customer, helping the business, and helping the employees. He has the unique ability to communicate what you need to hear, not just what he thinks you want to hear, in a genuine and kind manner. Passion for Motorcycling – a lifelong rider and enthusiast, Joe fits right in. He enjoys working on his four Nortons just as much as he enjoys riding them and we’re sure there is a BMW in his future. No matter where he has lived— Minneapolis, Detroit, Nashville, Buffalo, Baltimore—he has always strongly connected with the motorcycling community. If you find yourself wondering, what about Bob? The hope is now with Joe on board we will be able to get Bob out of his office more so we can all see him even more around the dealership, across the street at the new museum, and hanging out at rallies and other motorcycling events! 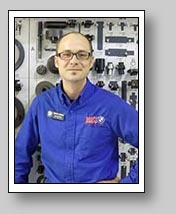 So the next time you stop by the dealership, please be sure to introduce yourself to Joe and give him a warm welcome!